20-year mark ... Haelg speaks at the event. Bahrain-based Sika Gulf, a joint venture between Swiss construction materials group Sika and Saudi Sumam Chemicals, aims to double its turnover in the next five years through organic growth and key acquisitions. 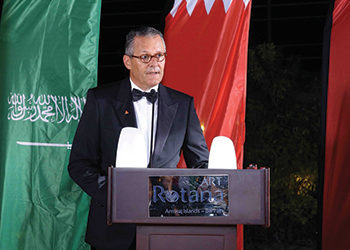 Ashraf Wahib, the area manager for GCC, revealed the news during a gala dinner held at Art Rotana in Bahrain last month to celebrate two decades of its operation in the Gulf. “Over the past 20 years, Sika Arabia has established itself as an industry leader in specialty chemical products and industrial construction materials,” he said. The dinner was attended by Swiss Ambassador to Qatar and Bahrain Etienne Thévoz, group chairman Paul Haelg, Sika Arabia chairman Abdulaziz Zaidan, and other key players from the construction industry. During the event, 27 employees, who had put in 15 years or more of service at the company, were honoured.